An enjoyable and successful weekend at Scotstoun Leisure Centre for this year’s West of Scotland Open where there were major upsets in the vast majority of the events. Andy Macpherson, Martin Johnson & Kayser Collins competed in the Men’s event on the Saturday which seen good results from all three players . Kayser qualified from his Men’s Band 2 group with wins over Kenny Lee and Paula Callaghan eventually losing 11-8 in the next round. Andy Macpherson worked his way through to the QF of the Band 1 eventually losing to John Hannah in a close match 3-2. Andy scored a fantastic 3-0 win over Calum Morrison, showing his recent hard work is paying off. Martin Johnson played some of his best table tennis to date on his way to winning the Band 1 event. With wins over Tam Lawler & Andy McFadyen in the group, he picked up great back to back wins v Calum Morrison (Scottish no2 Junior) 3-2 in the QF and a 3-1 win v Zaid Khalid in the SF. In the final, Martin overcame Edinburghs John Hannah 11-9 in the fifth set to pick up the winners trophy in a strong Band 1 event. Holly McNamara battled brilliantly to win the u13 Girls event with wins over Dumfries’s Shannon Brown, Drumchapels Amelia Smolarek and a win over her team mate Jess Hogg. Jess scored a 12-10 in the deciding game win against higher ranked Shannon Brown (Dumfries) . 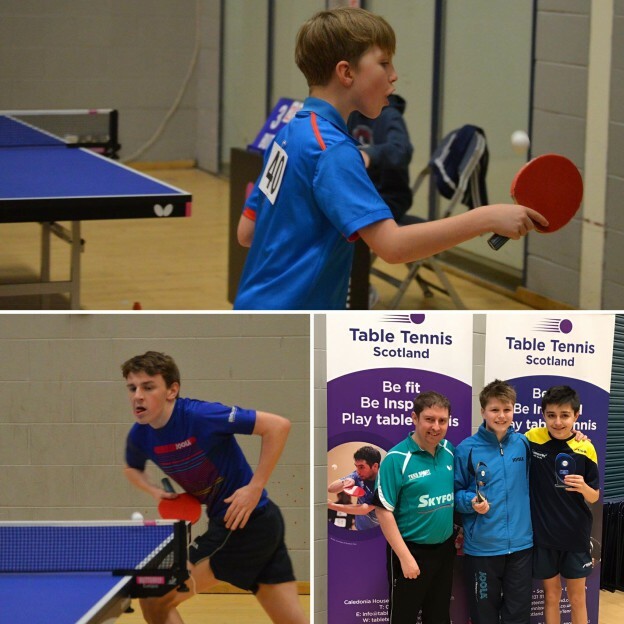 North Ayrshire had four of its up and coming players competing in the u13 boys. Top seed Jamie Johnson worked his way to final, Patric Hollywood and Chad Duncan finished in runners up position in their opening group where they meet each other in the first quarter final. Chad started well going up 2-1, however, Patric pegged it back to 2-2 and then went on to win the fifth set 11-7. Nathan Hogg who is currently improving fast, took his team mate Patric Hollywood very close in the group stage, with Patric just edging the win 15-13 in the fourth. Jamie Johnson got the better of Patric in the SF to set up a final against Aberdeens Josef Bokedal. Josef proved too strong for Jamie, who went on to win 3-0. Martin Johnson justified his top seeding of the U15 Boys, winning the event without dropping a set. Defeating James Forrest in QF, Harvey McDonald in SF & Dumfries’s Danny Bajwa in the final. First year u15 player Jacques Clapham showed great promise in his group stage, losing out in three close matches. In the Junior Boys Kayser Collins won an hard fought match v Edinburghs Luke Hennesey, 12-10 in the fifth set to qualify into the knockout stages. Robin & Owen Wilson both finished 3rd in their group, Robin picking up a win v South Ayrshires Chris Mexon. Martin Johnson reached the semi finals in the Junior Boys and scored another great win over Calum Morrison 3-2 to win his opening group. Martin then went on the beat James Forrest 3-0 in the QF, and then lost to Drumchapels Yaser Razouk in the SF. Big well done to all players and looking forward to next weekend’s Edinburgh Open at Bathgate. Entries close tomorrow.